We are a dedicated canine supplement company, who pride ourselves on delivering top quality products to ensure that your dog is at the peak of his health. We ship throughout the USA and Canada. Whole Hound products utilize top quality ingredients, and every product targeted to an essential nutritional requirement. We stock a wide range of vitamins for dogs as well as products designed specifically to provide pain relief for dogs. We source our ingredients from the best suppliers and only use the best ingredients available. This ensures your dogs diet includes the proper nutritional requirements. 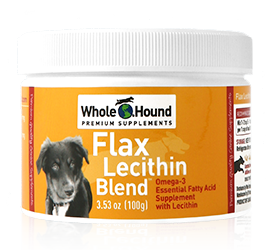 We believe that an upgraded diet, combined with a daily vitamin mineral supplement, plus an Essential Fatty Acid supplement will enhance your dog’s health and well-being. This is what we call the 3 Steps Forward feeding approach. We stock a range of quality products to ensure your dog, no matter what the age, is kept in top condition and full of health and vitality. We have a range of different supplements, to target different ailments and ages. These include digestive enzymes for dogs, omega 3 for dogs and vitamins for dogs, which provide optimum nutrition, and pain relief for dogs. To keep your dog full of life and with a spring in his step, look through our product page and see the differences it will make for your dog. “My dog was a stray that had his leg broken when he was hit by a car on a highway in Arizona. My grandson watched it happen and rescued him right away. Once home, we spent a fortune on surgeries and vet bills trying to get him back on track…. Have a question about Whole Hound™ products? Chances are we've already answered it! Please note: Information provided on this website is not intended to, nor should it, take the place of veterinary medical advice.